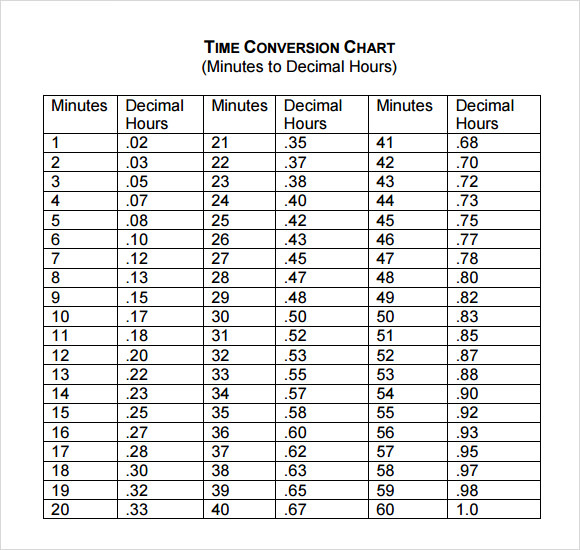 The purpose of time conversion chart is to increase our awareness of the time differences in all over the areas of the world. This is much appreciated when a person wants to have a knowledge regarding the time of a specific location or country. 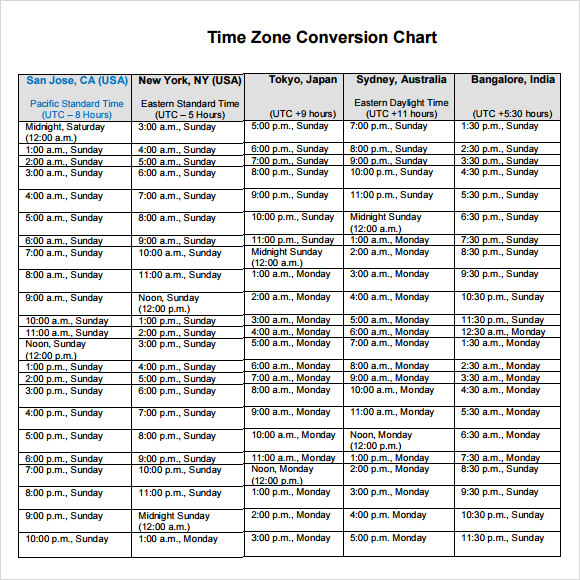 With the help of this designed tool for conversion, the time in every place is well computed and noted. The examples can get in the conversion chart specific for time in the website and can be also found at Microsoft word/excel. The examples are then downloadable in a preferred format type and in printable layout. These free Chart Templates will provide us details on how each country differs from one another aside to their distances but mostly on their time. Conversion charts are an already worked out tabular formatted charts which are helpful to convert one parameter to other. They have an important application that they are time saving tool and help one to avoid doing calculations which would have been required otherwise. There are multiple time zones in this world depending upon the latitudes and longitudes of the locations as well as the policies adapted by countries. 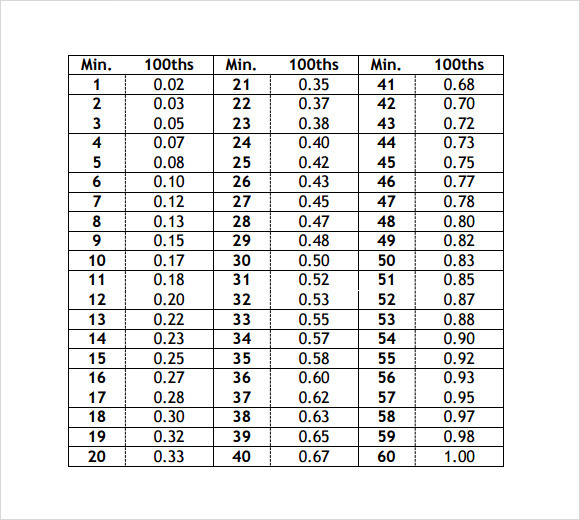 Thus, to provide a common reference for plus and minuses required while shifting from one time zone to other, time zone conversion charts are used. The representation of time also has been used in multiple manners all around the world. 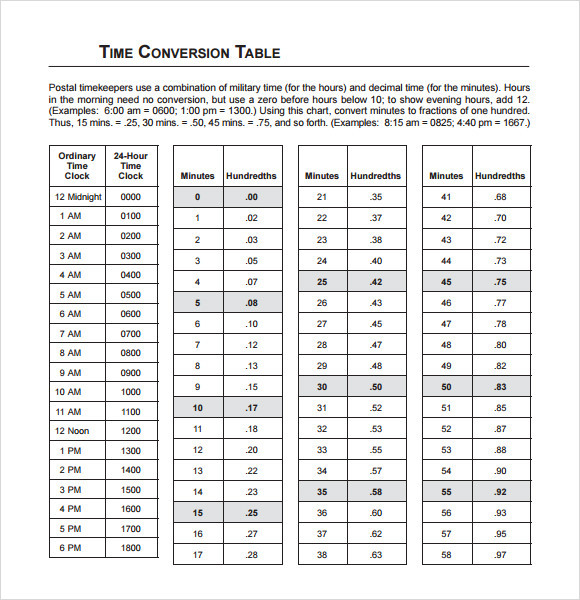 Thus conversion from 24 hour system to 12 hour system or inter conversion of minutes, seconds and hours into each other require the Time Conversion charts. When very accurate reference to time is required the time needs to be specified in hundredths of hours or minutes or seconds. 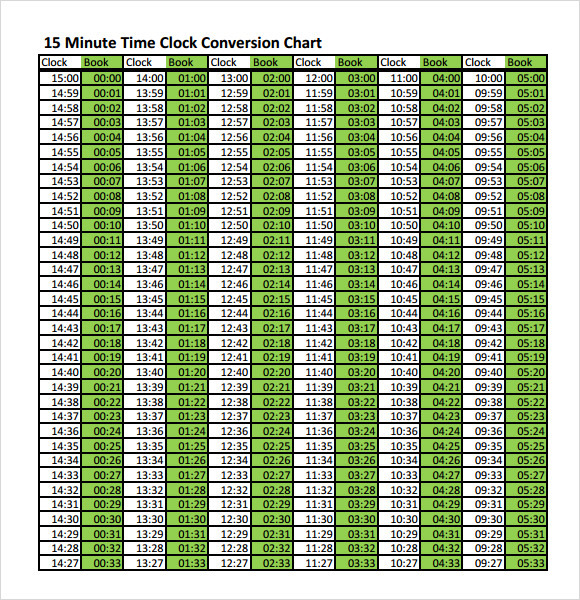 Time conversion table charts are an easy way to use the already undertaken conversions between various kinds of clocks. 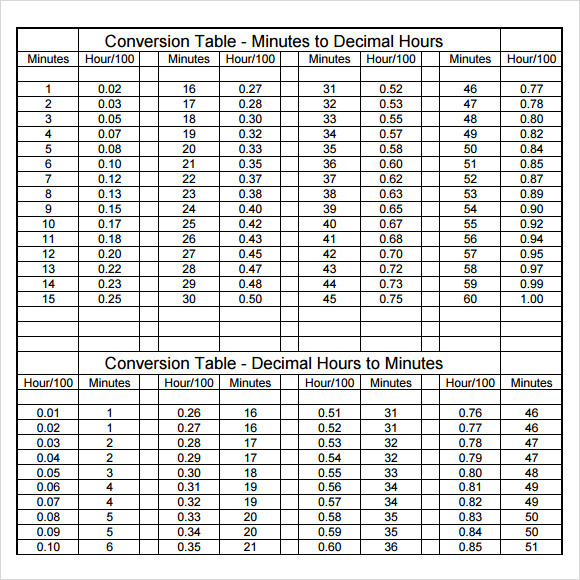 Why do you need Time Conversion Chart Templates for Free Download? The world is separated in terms of latitude and longitudes and hence different countries in the world have different sun rise and sunsets. Accordingly, the time at one country in east would be different at some other in west. In order to understand this, the world has been divided into separate time zones. 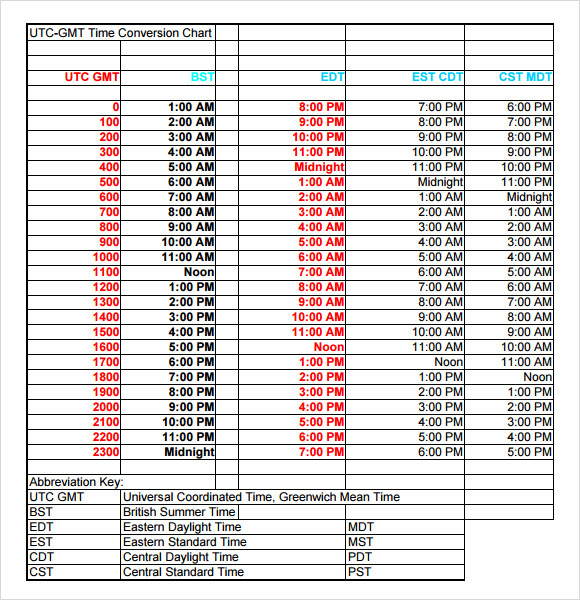 Thus, to find out present time in some other time zone vis-à-vis to one’s actual location, the time conversion charts are very handy. They help in conversion of times with respect to various time zones in the world and hence try to get everyone o a common grid. 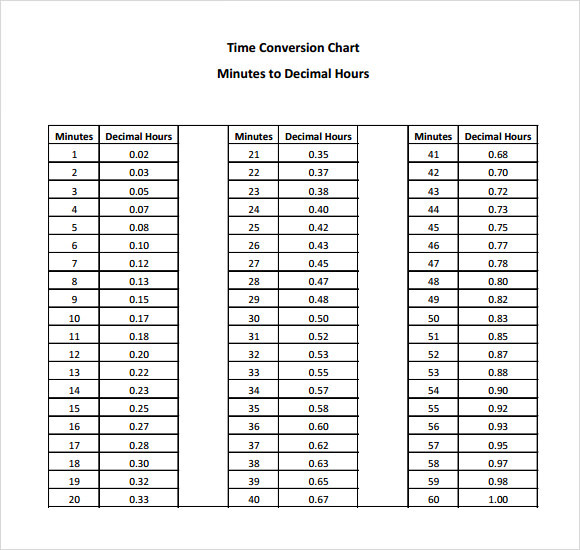 When do you need Time Conversion Chart Templates for Free Download? The time conversion charts are the easiest reference for any person who is traveling across continents to correct his time. They give a clear relation between various time zones like Greenwich Meantime, UTC, Pacific Standard Time, IST, etc. Further, with the advancements of IT sector and online digital transactions their applications have only increased. They have been a very handy tool even before the emergence of digital technology and hence used since long for various purposes. Further, these charts are very easy to use and no prior knowledge or understanding is required to use them. 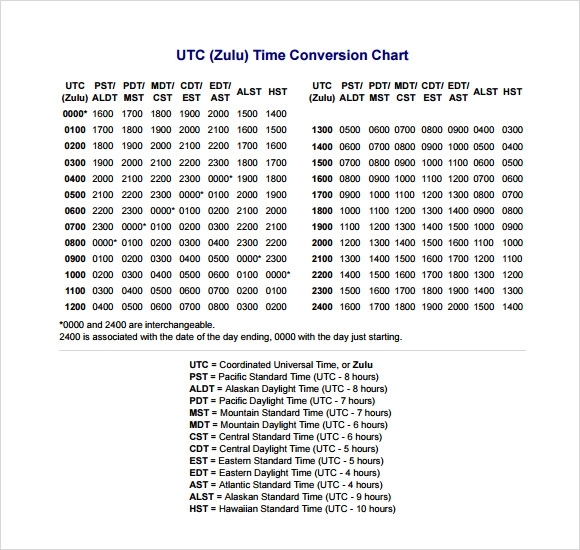 Time conversion charts are an ideal tool to connect the various time zones across the world in terms of actual understanding of who exists where and at what time. They are convenient to use and hence can be used by people travelling from one part of the world to the other.